The 6th International specialized Moscow Tuning Show exhibition took place in Moscow's Crocus Expo exhibition center in april. More than 80 companies and clubs took part in it, with approximately 25 thousand people attending the event. Modern automobile tuning is a wide-reaching industry that includes fine tuning car and motorcycle motors, units, and assembly, stylizing vehicle interiors and exteriors, setting up sound systems, as well as airbrushing. All of these areas of activity were on display at the Moscow Tuning Show. 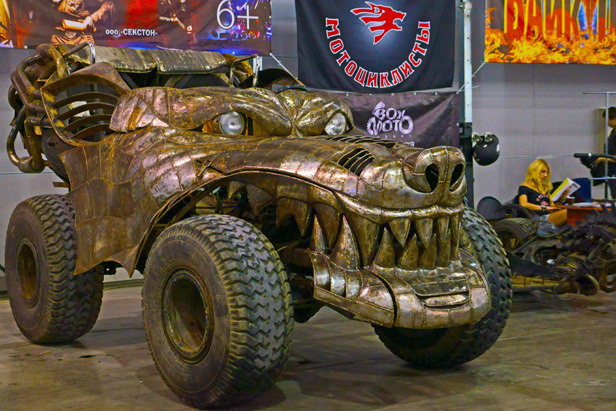 One of the exhibition's most exotic items was an enormous iron "wolf" created by the experts at one of Moscow's leading bike clubs who used a UAZ-469 off-road vehicle as its base. Most of the exhibition centered around the works of airbrushing artists. The themes of their projects were traditional: fantasy images, people, and animals.